Every two months or so, my sorority sisters and I meet for book club. I’ll admit that at first, I was skeptical about our ability to keep up our book club meetings. But, it’s been almost a year since we started, and we’re still going strong. Last weekend, it was my turn to host. The day that worked best for us was a Sunday, so we decided to meet for brunch. I usually end up making a ton of food for get togethers, so this time I tried to keep it low key. You remember the summer pizza from the multiple celebrations shindig Dan and I threw for his family back in June. Same summer pizza recipe, different veggies. This time, we used red bell pepper, green onion, celery, and carrots. 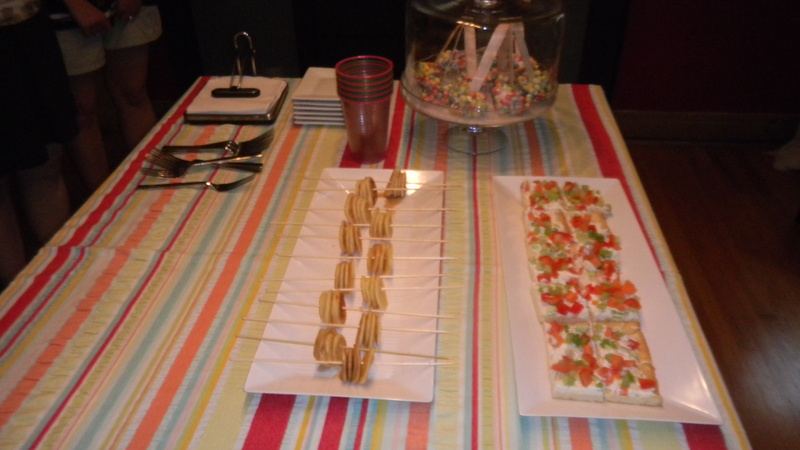 The Trix Treats was a new recipe for me, which I found here. It’s made sort of like Rice Krispie treats, except these are in ball form. They were pretty cute, though I did have some trouble with some of them staying together. The Mini Pancake skewers were nothing difficult. This dish was all about presentation. I whipped up about a cup of pancake batter and made teeny tiny pancakes. Then, just stick through a skewer and drizzle with syrup. 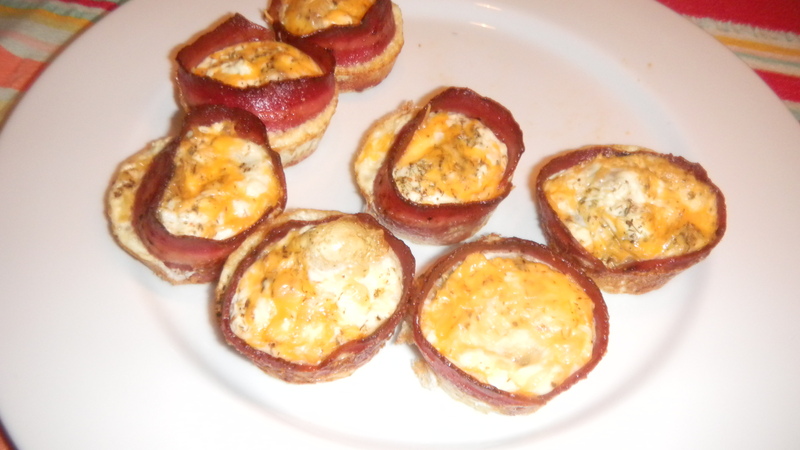 The trickiest dish was the Bacon and Egg cups. Dan had seen the recipe and knew he had to try it. 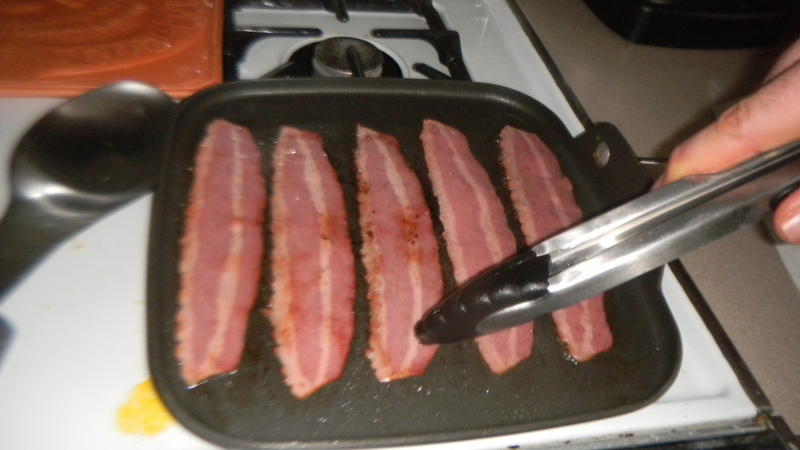 Start by frying up some bacon. We used the whole package. Pheebs ate the three or so leftover pieces. 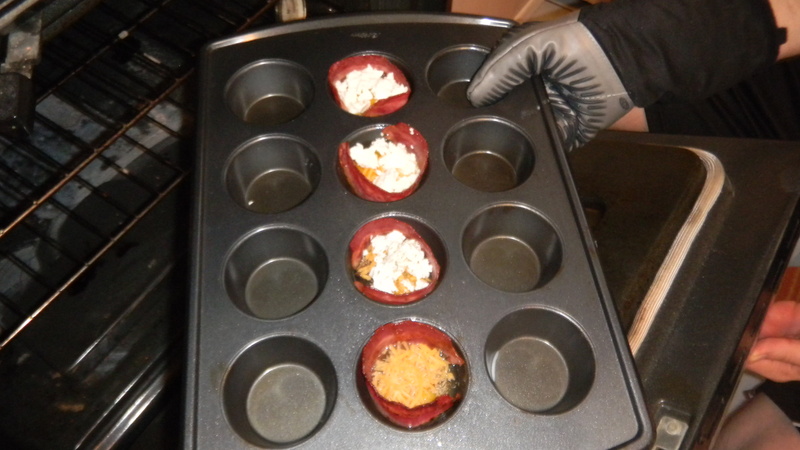 Once the bacon’s done, spray some muffin tins with non-stick cooking spray and line them with bacon. We used one piece on the outside and a small piece on the bottom. 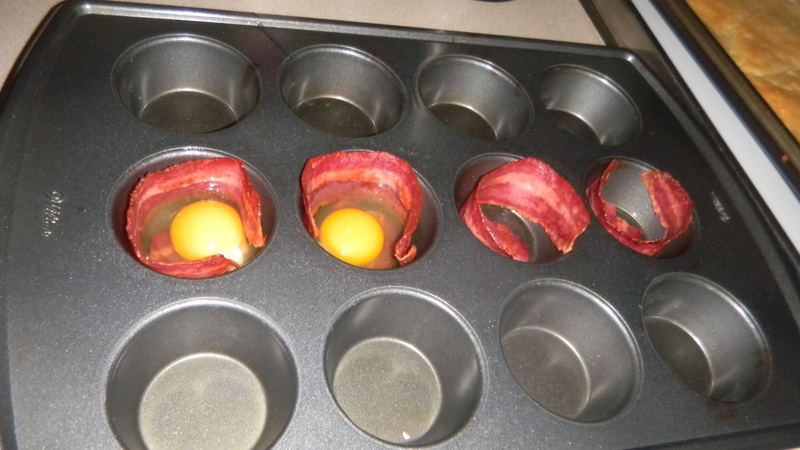 Crack an egg (try not to break it) and put it in the center of the bacon lined muffin tin. Top with your favorite kind of cheese (we used a mix of goat and cheddar), thyme, salt, and pepper. Bake at 400 degrees for about fourteen minutes, turning the pan at seven minutes. Immediately take the cups out of the tin. If you’re using a non-stick pan, be sure to use a plastic knife to avoid scratching your pan. Serve hot. I almost forgot to serve these! Dan to the rescue. That’s why, in the shot of the table that my fellow book-clubbers told me to take (for my blog post, of course), the Bacon and Egg Cups are missing. Oh well. I didn’t forget about the fruit salsa. It was really yummy. A big thank you to Erin for making it! 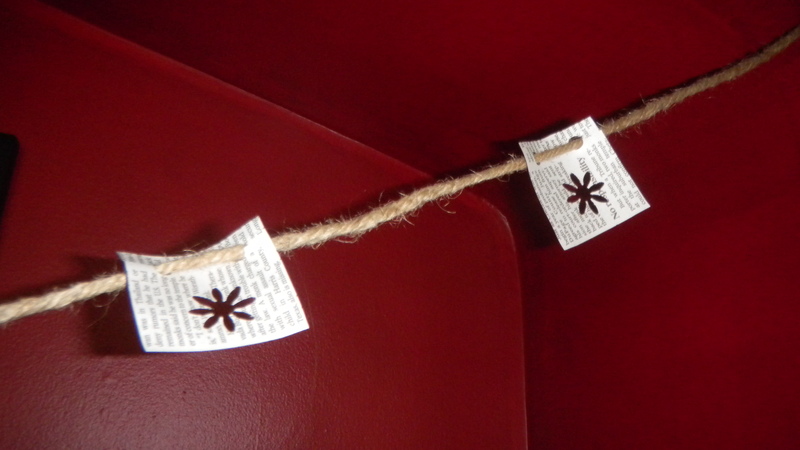 And finally, a quick note on the bunting I made. 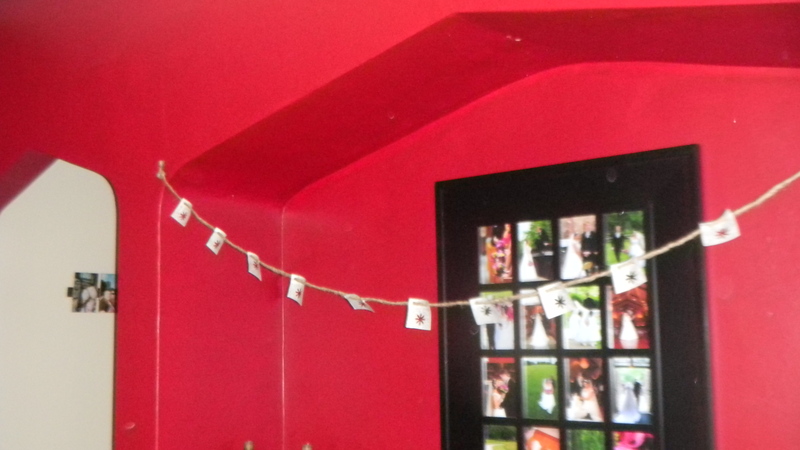 I cut some squares out of a piece of newspaper, hold punched a flower on each, then strung the paper onto some twine. Easy, and very book club theme appropriate. Looking forward to the next meeting, ladies! « Wait, I Can Use That!